Complete the form with as much information as you have about the building (details, photos, files, etc.). 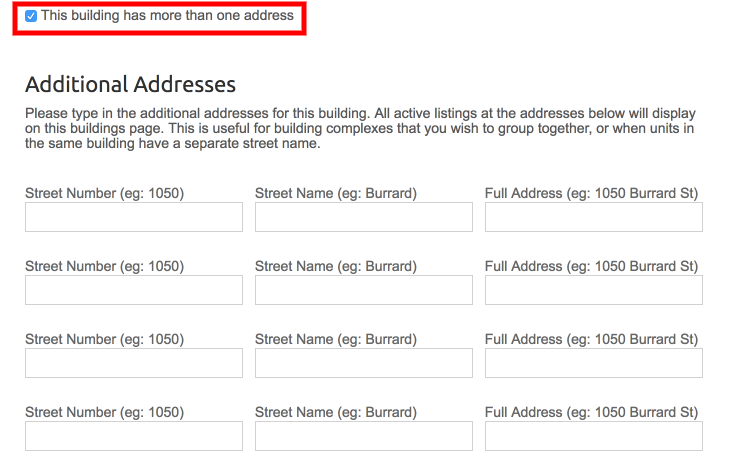 Note: Choose an option from the "area" dropdown to be presented with a list of all known addresses in that area. This will pre-populate the location fields and position the map marker automatically. Note: If your area is not in the dropdown provided, choose the last option "NOT LISTED - SPECIFY AREA" which will allow you to define your own custom area and sub-area. If you wish to separate your buildings into groups, please read our guide on how to make Custom Building Groups.